Knee arthroscopy is a procedure used to diagnose and treat certain problems in your knee joint. 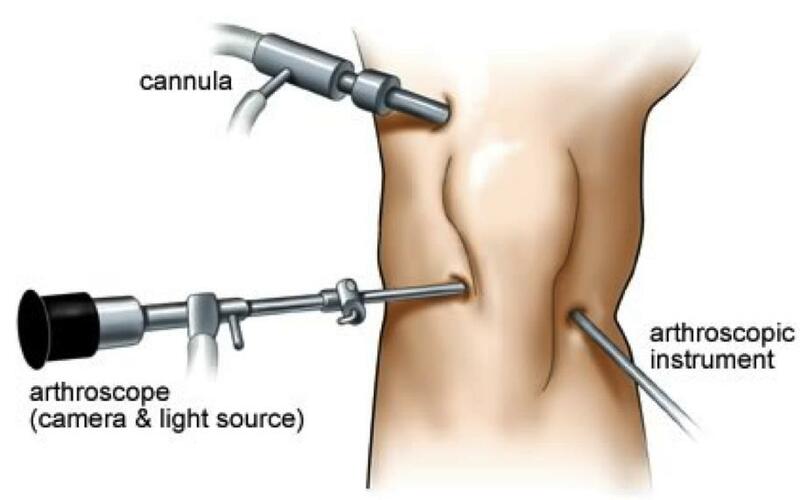 The procedure involves making a small incision and inserting a camera called an arthroscope into your knee, which helpsdoctors see what is happening inside of the joint, and once they know the real cause of concern, they can identify the right treatment option. In most cases, they repair small problems using the instruments within the arthroscope. Since it is a surgical procedure, it is natural to ask about knee arthroscopy recovery time. How long it takes you to recover from the procedure depends on a number of factors. When Is Arthroscopy Procedure Recommended? Before you inquire about the time it takes to recover from knee arthroscopy, you may be asking exactly why you need to undergo this surgical procedure. This usually happens when you have serious knee pain. In some cases, your doctor orders a knee arthroscopy to identify or confirm the condition causing your pain. Arthroscopic surgery can help diagnose and treat a number of knee injuries, including torn posterior or anterior cruciate ligaments, torn meniscus, factures in the knee bones, torn cartilage in the joint and swollen lining in the joint. It also proves effective in the removal of a Baker's cyst. How Long does It Take to Recover from Knee Arthroscopy? Normal knee arthroscopy recovery time is up to six weeks because your knee joint requires that much of time to reproduce joint fluid after surgery. This is the reason why you may not notice how effective your surgery was for the first few weeks. However, how long it takes someone to recover from surgery may be completely different from others who have undergone the procedure.There are patients who return to their normal activities within two weeks of their surgery, but this is rare. Keep in mind that it may take up to four months until swelling goes away completely and you regain your strength and flexibility. When Can You Return to Normal Activities? In most cases, you require at least six weeks before you could undertake strenuous physical activities, such as sport and heavy lifting. Your doctor will talk about it and explain how long it is going to take until you can resume your normal activities. Do not push yourself to return to normal activities if you are still experiencing pain. Taking rest will accelerate recovery. Usually, you need to use crutches for up to three days after your surgery. If you do not experience sever pain, you can try to walk without crutches. You may be able to walk without crutches by with a slight limp within five days of surgery. You can start driving when you can handle everything without pain, but this may take several weeks after your surgery. Your doctor is in the best position to help you with knee arthroscopy recovery time. Moreover, the nature of your job will also have an impact on when you can resume your activities – you should take at least a couple of weeks' off if your job involves heavy lifting or strenuous activity. Keep your leg elevated to reduce pain and swelling. Use icepacks for about half an hour for the first 48 hours after your surgery to alleviate swelling. Be sure to avoid driving or operating equipment when you are taking prescription pain medications after your surgery. Make sure to keep your wound clean and dry. While you will have a dressing covering your knee, you should avoid taking a shower for the first few days. If you really want to take a bath, cover your dressing with a plastic bag first. Replace your dressings immediately if they become wet and fall off. Your doctor will remove all the dressings usually in 5-10 days. Perform exercises to help strengthen your knee. Talk to your doctor about certain exercises you can safely perform to restore motion and strengthen the muscles of your knee and leg. You may even benefit from physical therapy. Will There Be Any Risks with Knee Arthroscopy? Just like any other surgical procedure, there are certain risks associated with knee arthroscopy. The most common risks are excessive bleeding, breathing difficulties when under anesthesia, infection at the site of incision, and allergic reaction to medications. Some people may experience bleeding inside the knee joint with infection inside it. You may even develop a blood clot in the leg and have stiffness in the leg because of your surgery. There is also risk of injury to the ligaments, cartilage, blood vessels, meniscus, and nerves of the knee. While a knee arthroscopy is less invasive procedure, you may still develop certain complications after your surgery. You should contact your doctor immediately if you have a high temperature with severe pain and swelling. Call your doctor if you notice foul-smelling or discolored discharge from your wound. If you notice tingling or numbness, you should inform your doctor about it because it could be due to nerve damage.